We’d love your help. Let us know what’s wrong with this preview of Skulls by Simon Winchester. "Skulls" is a beautiful spellbinding exploration of more than 300 different animal skulls---amphibians, birds, fish, mammals, and reptiles--written by "New York Times" bestselling author, Simon Winchester and produced in collaboration with Theodore Gray and Touch Press, the geniuses behind "The Elements" and "Solar System." In "Skulls," best-selling author Simon Winchester "Skulls" is a beautiful spellbinding exploration of more than 300 different animal skulls---amphibians, birds, fish, mammals, and reptiles--written by "New York Times" bestselling author, Simon Winchester and produced in collaboration with Theodore Gray and Touch Press, the geniuses behind "The Elements" and "Solar System." In "Skulls," best-selling author Simon Winchester (author of "The Professor and the Madman"; "Atlantic: A Biography of the Ocean"; "Krakatoa: The Day the World Exploded"; and others) tells the rich and fascinating story of skulls, both human and animal, from every perspective imaginable: historical, biographical, cultural, and iconographic. Presenting details about the parts of the skull (including the cranium, the mandible, the shape and positioning of the eye sockets, and species-specific features like horns, teeth, beaks and bills), information about the science and pseudoscience of skulls, and a look at skulls in religion, art and popular culture, his stories and information are riveting and enlightening. At the center of "Skulls" is a stunning, never-before-seen-in-any-capacity, visual array of the skulls of more than 300 animals that walk, swim, and fly. The skulls are from the collection of Alan Dudley, a British collector and owner of what is probably the largest and most complete private collection of skulls in the world. Every skull is beautifully photographed to show several angles and to give the reader the most intimate view possible. Each includes a short explanatory paragraph and a data box with information on the animal's taxonomy, behavior, and diet. To ask other readers questions about Skulls, please sign up. .Furry Books With Sticky Red Pages. Blowing On Horns And Teeth, Etc. Most people who like natural history and the outdoor world are, in my experience, entranced by skulls. We find them beautiful (assuming the stinky parts are long gone) and they tell tales about the species and the individual. The individual tales are often tragic--a horse skull with a broken lower jaw, a coyote skull with a bullet hole, a smashed skull from a road-killed raccoon. The species tales are less freighted. Teeth and sagittal crests imply how the animal made its living and defended its Most people who like natural history and the outdoor world are, in my experience, entranced by skulls. We find them beautiful (assuming the stinky parts are long gone) and they tell tales about the species and the individual. The individual tales are often tragic--a horse skull with a broken lower jaw, a coyote skull with a bullet hole, a smashed skull from a road-killed raccoon. The species tales are less freighted. Teeth and sagittal crests imply how the animal made its living and defended itself. This hardcover is a beautiful collection of Nick Mann's photos of skulls that were prepared by a private collector, Alan Dudley. Dudley came to Winchester's attention after getting busted buying an illegal howler monkey skull. He pleaded guilty, did his service and paid his fine, and the implication is that he isn't normally one to slip up in this way. I find this pretty satisfactory--he does a great job with the skulls and shares his expertise AND he serves as a lesson to other collectors not to get carried away and promote a market for slaughtering rare animals. (Replicas of many species are readily available, by the way.) Dudley gets almost all of his skulls from zoos. Among this book's virtues are a plethora of bird, fish and reptile skulls. Photographs of mammal skulls are widely available as they are the taxonomic touchstone for mammals. The others, not so much. Partly they are less common because (I know from trying) fish and reptile skulls can be the very devil to prepare. Of special interest: a great assortment of hornbills, odd and fragile skulls of venomous snakes, wild pigs with their seemingly self-destructive curving tusks. Be sure to take a look at the domestic dog skulls and consider what we have done to the sturdy wolf. Most of the photos are by Nick Mann, who has done great work on other Workman Publishing science books as well, and most are excellent. Many of the smaller skulls are out of focus, however. Printing the images against a black background works very well for most skulls, but much detail is lost for black bird bills (such as the Northern Shoveler) and the black horns of some bovids.The photo of Holbein's large painting The Ambassadors lacks details discussed in the text. Most of these weaknesses are demerits for the printer, not the author or photographer. The skulls on display here range from oddly cute to the stuff of nightmares. All are fascinating. You come away with a whole new appreciation of the way in which life forms evolve and adapt to their places in the ecosystem. Most of the skulls in Dudley's collection are antiques or came from deceased zoo animals. However, it is easy to see how the passion for collecting could lead to unethical behavior. We read in the beginning of the book how Dudley was charged for buying a few skulls that were The skulls on display here range from oddly cute to the stuff of nightmares. All are fascinating. You come away with a whole new appreciation of the way in which life forms evolve and adapt to their places in the ecosystem. Most of the skulls in Dudley's collection are antiques or came from deceased zoo animals. However, it is easy to see how the passion for collecting could lead to unethical behavior. We read in the beginning of the book how Dudley was charged for buying a few skulls that were obviously poached. This lends a bit of sadness to the book. Skulls is interesting from an animal welfare prospective in another way. Examining the skulls of certain pedigree breeds helps us understand just to what degrees we have changed animals' physiology in pursuit of the "perfect" look, and what unpleasant lives we may be subjecting our "beloved" pet animals to in the process. The skull of a normal domestic cat, for example, is a fascinating miniature replica of those of the mighty big cats who prowl the plains, forests and jungles. The skull of the Persian cat, however, is a sad, crushed-looking thing. In our bodies, the framework for muscles, tendons and ligaments is the skeleton, topped by a skull, a face as unique as each creature itself. Whether it be a reptile, primate, eel, catfish, frog, newt or penguin, the skull houses the central processing unit, the brain. This powers each animal, bird or snake. Teeth highlight the jaw and in some, a prominent brow ridge or horns crown the whole in magnificent glory. Alan Dudley was fascinated by skulls. At an early age, he found the body of a dead f In our bodies, the framework for muscles, tendons and ligaments is the skeleton, topped by a skull, a face as unique as each creature itself. Whether it be a reptile, primate, eel, catfish, frog, newt or penguin, the skull houses the central processing unit, the brain. This powers each animal, bird or snake. Teeth highlight the jaw and in some, a prominent brow ridge or horns crown the whole in magnificent glory. Alan Dudley was fascinated by skulls. At an early age, he found the body of a dead fox and brought it home to inspect it in greater detail. However, prepping the skull for collection proved to be a bit of a trial. Maggots, which feasted on the flesh of the carcass, were often a little overzealous, leading to damage of fine bone. The alternative was to soak each skull in water for a very, very long period of time, allowing the natural bacteria to run their course. This avenue proved to be extremely smelly, but very effective and at last, Dudley’s collection began to grow in earnest. Unfortunately, Dudley’s zeal for collecting led him to obtain the skulls of a few endangered species, which ultimately progressed to his arrest. Nevertheless, Dudley’s collection remains one of the most detailed accounts of fauna on the planet. Unique book and portrait of a fascinating collection. This book's title is right about one thing, and that is that Alan Dudley's collection of skulls is definitely curious. Whether or not that is a good sort of curiosity or not is up for debate, but it is a curious collection without dispute. The origins of this book are somewhat odd. Alan Dudley himself happens to be an English collector of skulls who has perhaps the largest private collection in the world, of which this book represents only about a seventh or so (some 300 of the more than 2,00 This book's title is right about one thing, and that is that Alan Dudley's collection of skulls is definitely curious. Whether or not that is a good sort of curiosity or not is up for debate, but it is a curious collection without dispute. The origins of this book are somewhat odd. 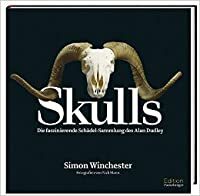 Alan Dudley himself happens to be an English collector of skulls who has perhaps the largest private collection in the world, of which this book represents only about a seventh or so (some 300 of the more than 2,000 skulls in the collection). Dudley ran afoul of various English laws involving the importation of skulls of various protected animals and appears to have sought in this book some means of recovering his reputation and increasing his popularity through sharing at least some of what he has collected with a friendly audience. And if you like the macabre, as I do, there is a great deal to enjoy here. He certainly has chosen wisely in having his collection and its context narrated by Simon Winchester, although it must be freely admitted that the real stars of the show are the creepy skulls themselves. 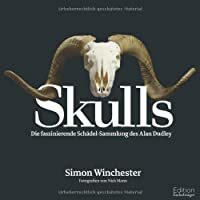 This book of about 250 pages of lushly photographed skulls (mostly from Dudley's collection, with some supplements) begins with an introduction and some notes on the collector as well as the collection by Simon Winchester. After this there are a few pages of amphibian skulls, some frogs and newts, followed by a couple of essays. Then there are about 50 pages of pictures of the skulls of birds, a wide variety including seabirds, birds of prey, game birds, kingfighers and hornbills, toucans and woodpeckers, nightjars and swifts, flightless large birds, owls, parrots, passerines, penguins, pigeons, wading birds, and waterbirds, including essays on the Dodo as well as pseudocience. There is a lengthy chapter containing a variety of fish skulls (including eels), with essays about the iconography of skulls including the importance of skulls in Mexican culture. There is a large essay of nearly 100 pages about mammal skulls, including a wide variety of mammals, even egg laying mammals (sadly, no echidnas), as well as a lot of primates and rodents and even some oddball animals like the rock hyrax and tapir and tenrec. The last chapter contains skulls of various reptiles, including alligators and crocodiles, lizards and snacks, and various turtles and tortoises. This is a very interesting book. As promised, it explores Alan Dudley's skull collection from five vertebrate classes. It also contains longer sections between the photographs exploring skulls from biological, historical, anthropological, and cultural perspectives. Even if you don't have time for the longer sections, the photography provides an engaging flip through. There is a disclaimer in the beginning that the photographs are not to scale; however, I think some graphical indication of scale s This is a very interesting book. As promised, it explores Alan Dudley's skull collection from five vertebrate classes. It also contains longer sections between the photographs exploring skulls from biological, historical, anthropological, and cultural perspectives. Even if you don't have time for the longer sections, the photography provides an engaging flip through. Someone please buy me this magnificent book. I've never had a more useful photobook for painting. Never. I've never seen a more beautiful array of skeletal biodiversity in such a lovely package. I just... Need this, you guys. Really interesting survey of a collection. There's such a variety of skulls explored with facts about the animals and personal blurbs from Alan Dudley. The photographs of the skulls are beautifully rendered. It was okay. One thing that turned me off is that one of the photos didn't match the skull listed. Would be a good flip-through, coffee table book. Despite how extensive the collection depicted is, I wanted more - more sculls, more comparisons. A fascinating book. This ebook is about every type of skull you can possibly think of! I enjoyed how the types of skulls were in alphabetical order. However, it was difficult for me to figure out how to escape from a close up view. If you clicked on the skull, you could spin it in 3D or learn more facts about the type of species. Not only does it show the skeleton, but it shows the life-like view of the creature as well. This is a great ebook with tons of information! I noticed that this book allowed you to spin the This ebook is about every type of skull you can possibly think of! I enjoyed how the types of skulls were in alphabetical order. However, it was difficult for me to figure out how to escape from a close up view. If you clicked on the skull, you could spin it in 3D or learn more facts about the type of species. Not only does it show the skeleton, but it shows the life-like view of the creature as well. This is a great ebook with tons of information! I noticed that this book allowed you to spin the 3D skull very fast, slow, or paused. I thought it was very interesting to view the full skeleton of some species. For example, the monkey and the human compared were very similar. I gave it a four-star rating because it is very interesting and full of information, but it can be complicated to use in certain situations. For class, I would give each group an iPad and an animal. They will have to search facts and new information they learned about the species. After they have found at least five facts about the species, they will have to share it with the class. By doing this activity, the students will learn: about the species, how to find information about a species from the ebook, and to communicate with their group. The students will have to agree on the facts they will share with the class, as well as write the information down. Skulls tell the story of the skull in the human and animal world. This electronic book states that skulls are symbols both of existence and of former existence. Skulls tell about life, death, and afterlife of good and evil. This book talks about all different aspects of skulls and skulls of art along with the general nature of skulls and its component parts. This book’s illustration really gives the reader a great understanding of skulls it provides variety and hands on learning for the students Skulls tell the story of the skull in the human and animal world. This electronic book states that skulls are symbols both of existence and of former existence. Skulls tell about life, death, and afterlife of good and evil. This book talks about all different aspects of skulls and skulls of art along with the general nature of skulls and its component parts. This book’s illustration really gives the reader a great understanding of skulls it provides variety and hands on learning for the students. This electron collection of skulls reminded me of my high school biology lab only better. Although you cannot get the hands on experience with the Skulls book, they had a lot of things in common. There were a variety of different skulls you are able to look at, and it provides you with additional information. I think this is why the book was so appealing because of the movements of the skulls, and it was something I have already touched on in school. This book would be great for a science lecture, or if the children were doing a project on a certain animal and needed to provide information about the skull. I would use this as a source of information for the students, and walk them through the book and all the contents it provides. This way if I were to give them a project that asked for them to draw a picture of a certain animal’s skull and provide some information the students would know where to go to attain this information. There was no lexile score for this book, but children should be able to read this book independently by fourth grade just because some of the word content could be a little hard to understand for some of the younger classes. This is an amazing photographic record of Alan Dudley's private collection of animal skulls. An avid collector, Dudley has been collecting skulls for years, buying them or preparing them himself when he comes across a dead animal. But more than just a record of his collection, this book, courtesy of author Simon Winchester, delves into the enduring human fascination with skulls and what they represent. What skulls have historically symbolised, how they have appeared in art, how they are celebrat This is an amazing photographic record of Alan Dudley's private collection of animal skulls. An avid collector, Dudley has been collecting skulls for years, buying them or preparing them himself when he comes across a dead animal. 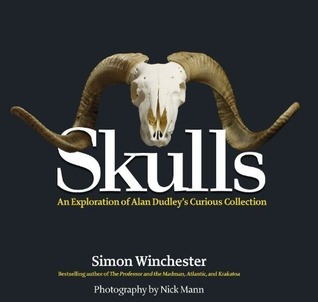 But more than just a record of his collection, this book, courtesy of author Simon Winchester, delves into the enduring human fascination with skulls and what they represent. What skulls have historically symbolised, how they have appeared in art, how they are celebrated (Mexico's Day of the Dead), their component parts, and how they have been studied (phrenology anyone?) are all covered. The photographs of the skulls of Dudley's collection are also amazing. How some animals have adapted and what their skulls look like are truly breathtaking. Some are beautiful, some are bizarre, and some barely seem to represent the living animal. For example, the elephant, sans trunk and ears, is unrecognisable. Lion, tiger and grey wolf skulls are incredibly similar, and there is the poignant inclusion of the dodo skull. Not part of Dudley's collection, but included from a museum as a reminder of what has been lost. This is a somewhat peculiar book because it displays the collection of a private British skull collector who at times surrendered his moral compass to his collecting fervor. Nevertheless, I give it 5 stars, a thing I rarely award, for its excellent photography. It gets about a 2-star rating for its writing. The written portions divide neatly into two categories: a few larger expositions on the subject of skulls in general and a lot of small bits that are basically identifiers and captions for the This is a somewhat peculiar book because it displays the collection of a private British skull collector who at times surrendered his moral compass to his collecting fervor. The written portions divide neatly into two categories: a few larger expositions on the subject of skulls in general and a lot of small bits that are basically identifiers and captions for the photos. The captions can't help but be repetitious sometimes, dealing as they do with limited subject material. There are only so many things a person can say about sagittal crests, mandibles and zygomatic arches. Mr. Winchester loses no stars for that. The larger pieces suffer from sheer eccentricity of subject choice, repetition (again) and vacuousness...and the reader suffers along with them. Really- very poor work. Someone had space to fill and didn't bother to find good material to fill it with. This was a fascinating book. An odd book, but fascinating. It is a both a scientific/biological book, and an expose on a very unique private collection. The pictures of the skulls are beautifully shot, and they are always partnered with a photograph of the living animal, showing how the bone relates to the shape of the head in life. I will say, though, that I have a few concerns in regards to ethics. The collector has quite a few skulls from endangered animals, and there was not nearly enough inf This was a fascinating book. An odd book, but fascinating. It is a both a scientific/biological book, and an expose on a very unique private collection. The pictures of the skulls are beautifully shot, and they are always partnered with a photograph of the living animal, showing how the bone relates to the shape of the head in life. I will say, though, that I have a few concerns in regards to ethics. The collector has quite a few skulls from endangered animals, and there was not nearly enough information on provenance for my taste. I doubt any are illegal per se, but legality != ethics, in many cases. Some of these fantastic images will live on in my nightmares. Thank you, Alan Dudley. Best skulls belong to birds, reptiles, and snakes. Wait, are snakes reptiles? This would've gotten 5 stars had the blurbs on each skull included just a BIT more detail. For instance, I was fascinated by the skulls of alligators and crocs because of the mottled and pitted texture of the bone. I read every blurb hoping for information on WHY the texture of those bones was so different from most of the hundreds of Some of these fantastic images will live on in my nightmares. Thank you, Alan Dudley. This would've gotten 5 stars had the blurbs on each skull included just a BIT more detail. For instance, I was fascinated by the skulls of alligators and crocs because of the mottled and pitted texture of the bone. I read every blurb hoping for information on WHY the texture of those bones was so different from most of the hundreds of other specimens in the book, but I didn't find what I was curious about. So, on to Google. Still, included some really cool information in a beautifully photographed volume. Way better than just looking up skulls online. I bought this mostly as a reference book. I have enjoyed looking at all the lovely photos, but haven't read all the articles/text. To me books like this are not something I read cover to cover. They are books I turn to when I need to find info to help ID a particular skull, or to discover new skulls I would like to eventually add to my collection. Fascinating books about the skull collection of Alan Dudley, a resident of England who has a private collection of 2,000 skulls of various creatures, from mice to Gaboon vipers. The amazing diversity of skull type and shape from species as various as the toucan to the grizzly bear is fascinating. With commentary by Simon Winchester. I have been using this book for my warm-up paintings each morning. I enjoy the variety of shape found within each of the different kinds of skulls. The photography and layout is well-done. A fun book to experience over and over. What an amazing, informative book about the world's largest private collector of skulls, and his incredible collection. Great trivia, wonderful pictures, and cool anecdotes. I got it at the library, and just HAD to own it. Thanks, Amazon! Beautiful photographs, well written essays on a variety of skull-related themes. One can only take in so many skulls, however, and the essays tend to read like homework assignments, however nicely composed. 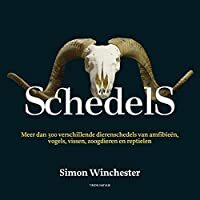 Amazing photographs of animal skulls from prehistory to the present with solid science about the evolution of the skull across species. Definitely worth reading in the paper copy for full effect of the photography. I would highly recommend this book just for the amazing photography. It is a very beautiful collection. They did a great job picking a variety of specimens, and in addition to the beautiful pictures there is a lot of interesting factual information. Love this book. I can't stop going through it. I just carry it around everywhere. Best purchase I've made in the last two months. So informative and pretty. I love it! I need to find more books like this. What a fun and interesting book, seriously. Fact-filled text combines with stunning photography to give us a book that should appeal to a wide variety of persons. Some of skulls jump out as possible inspirations for H.R. Giger's design for the movie, "Alien." Simon Winchester, OBE, is a British writer, journalist and broadcaster who resides in the United States. Through his career at The Guardian, Winchester covered numerous significant events including Bloody Sunday and the Watergate Scandal. As an author, Simon Winchester has written or contributed to over a dozen nonfiction books and authored one novel, and his articles appear in several travel publ Simon Winchester, OBE, is a British writer, journalist and broadcaster who resides in the United States. Through his career at The Guardian, Winchester covered numerous significant events including Bloody Sunday and the Watergate Scandal. As an author, Simon Winchester has written or contributed to over a dozen nonfiction books and authored one novel, and his articles appear in several travel publications including Condé Nast Traveler, Smithsonian Magazine, and National Geographic.